Congratulations to Angela W. and Manuel M. for winning the Motorola Roadster giveaway! 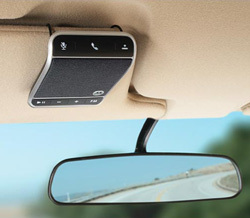 Win a Motorola Roadster In-Car Speakerphone! Spring/Summer cleaning time continues at Techlicious and we have two (2) Motorola Roadster In-Car Speakerphones that need new homes. The Motorola Roadster retails for $99.99. We've got two to give away, which means we will have two winners (only one prize allowed per person). But this is a quick one, so enter now through July 10th, 2011 for a chance to win! Tell your friend about our newsletter and get up to FIVE additional entries, one for each friend you tell. Go to our Tell-a-Friend page and enter the email addresses of five friends. Be sure to provide your valid email address so we can track your entries. Become a Fan of the Techlicious Facebook Page and you'll get one extra entry. Just "Like" us in the Facebook box and the post a second comment below for your Facebook entry (Yes, we know it's a little bit of a pain to post twice, but we need to track your entry!). Don't post your entry on the Facebook page, we can't accept entries there. Already a fan? No worries. Just tell us below in a comment. We will randomly select two (2) winners from the entries. No purchase is necessary to win. The giveaway will end at 11:59pm on July 10th, 2011. Void where prohibited. U.S. residents only. Click here for the full rules. I would like to win because I really don’t like to wear a bluetooth because it hurts my ear. but this would be cool because I can still answer calls hands free. Thank you for the chance to win. I’m already a Facebook fan of Techlicious and receive your e-mail newsletter. Please enter me in this contest. I subscribe via evrywoman at yahoo dot com. I want to win! Please enter me in the Motorola Roadster In-Car Speakerphone drawing. Thanks! And I liked your page on Facebook for an extra entry. Please enter me in the Motorola Roadster contest, thanks. Came here for the “Motorola Roadster In-Car Speakerphone Giveaway” I enter and found some other GREAT info . . . thanks! Yes, I want to win. Yes, I want to win. This would be great, especially for when I have my grandchildren in transit and I get a call. Keeping my attention on the road is especially important for their safety! So yes, I want that Motorola Roadster!! Thanks for the opp to win a great prize!! I would like to enter the roadster giveaway. Thanks for the opportunity. I have subscribed and want to enter! Entering to win for a dear dear friend that drives for work and has trouble converting to hands-free - and talks a lot! Please enter me in the sweepstakes. Thank you. Would love to win this, thanks so much for giving me the chance!! I’m already subscribing. Thank you! This is a really cool speakerphone that I would LOVE to win!